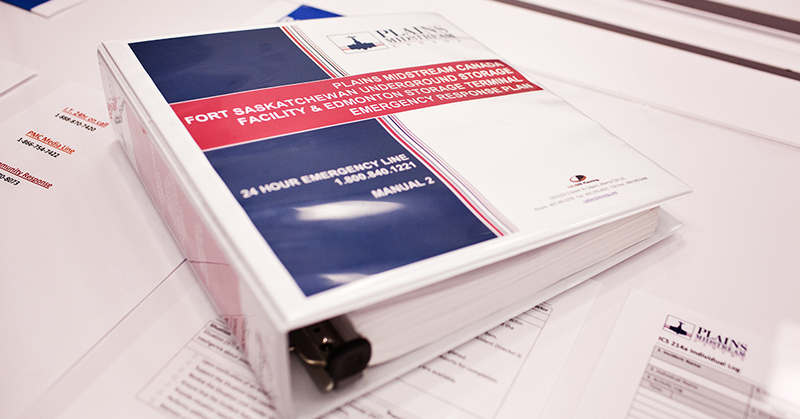 PMC co-ordinates all Emergency Response Plans (ERP) and first responder activities for our regulated pipelines and facilities through the overarching Emergency Management program. PMC has federally and provincially governed ERPs and has established site-specific and tactical plans for our areas of operation deemed to be critical. Within our ERPs, PMC establishes emergency planning zones (EPZ) using approved methodology set out by the Alberta Energy Regulator, the Canadian Association of Petroleum Producers (CAPP) and in accordance with our risk management protocols. Our risk management protocols include the engagement of key stakeholders to identify hazards, assess risks and develop controls to ensure protection of the public and the environment. For more information on EPZ requirements in Alberta click HERE and the CAPP companion guide can be found HERE. PMC's ERPs are developed and tested in coordination with first responder’s local authorities and regulators. Please visit our Training and Exercises page for more information on emergency management exercises. This manual is arranged with the company response personnel in mind. The first eight sections are what form the PMC Core Emergency Response Plan (Core ERP) and are consistent across all PMC operations and associated ERPs. Sections 8 and 9 contain all area and/or site specific information to each ERP. The table below provides additional information. An introduction to the plan that outlines the Emergency Management Program and the emergency response framework. Provides an Initial Response Checklist to intiate an incident response and activate the Incident Management Team while considering the safety of responders, workers and the public. Outlines the ICS Planning cycle and contains roles and responsibilities checklists for all possible Incident Management Team and Incident Support Team positions. Processes and considerations to protect responders and to determine the safest way to protect the public during an incident. Information and procedures specific to various identified incident types. Note that these are not Standard Operating Procedures and outline general guidelines emergency responders to consider. Provides an overview of the Crisis Communications Manual and outlines protocol for emergency communications and general media interactions. Includes all forms required in an emergency (Government First Call, Incident Command System, Public Safety and Emergency Operations Centre). General ERP related information including: regulatory references, plan maintenance, acronyms, glossary terms, and product characteristics. Outlines the notification requirements and contains the roles and responsibilities for lead and supporting agencies that are specific to the ERP. Also includes the roles and responsibilities for local/regional authorities and mutual aid. Includes contact information, maps, technical data, response equipment, lead agencies, support services and confidential information. In April, 2016, The National Energy Board (NEB) issued order MO-006-2016 which requires NEB regulated oil and gas pipeline companies to publish emergency response plans. The public’s desire to have more information about emergency management is in line with PMC’s commitment to clear communications and transparency to stakeholders. In addition to ERPs, there are several other types of plans that could be implemented during an emergency, depending on the situation. This could include wildlife response and rehabilitation plans, waste management and remediation plans, and other plans in place to manage specific and potential impacts. For more information, please email emergency.management@plainsmidstream.com.